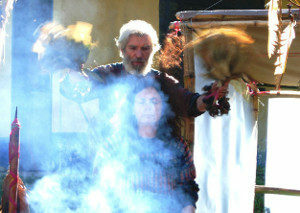 We offer Ayahuasca and San Pedro Ceremonies with Dr. Valentin Hampejs, M.D. in General Medicine in Neurology and Psychiatry Shaman and researcher on Indian shamanism for the Ministry of Public Health of Ecuador. 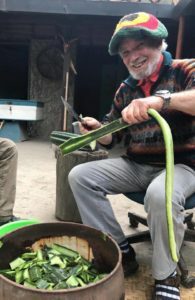 We offer ceremonial Ayahuasca & San Pedro, the sacred power plants of the South American Andes- for the healing of depression, Schizophrenia, Multiple Sclerosis, degenerative illnesses, drug addiction and other disorders. Allow me to familiarize you with the nature of our seminars. The history of shamanism throughout the millennia is already well established. Archaeological and ethnological investigations have verified it without any question. In comparison, modern scientific medicine is only a baby – a few centuries old – characterized by a game of always speedier and riskier new “advances” and the “latest knowledge” about the reality of life. How long can it last? It is only common sense to realize that the ancestral wisdom of shamanic medicine does not need to justify itself in relation to the superiority claims of this scientific baby, since shamanic medicine is primarily defined by a deep and authentic respect for life. “Pure, rational science” cannot pretend to the same ethical level, as it keeps filling military arsenals with more gigantic means of nuclear, chemical, biological and high-tech killing. The threat of apocalyptic self-destruction of all humankind is unquestionably – apart from the obvious benefits of our scientific era – the main contribution of our natural sciences. Unfortunately, countless men and women in our modern industrial societies have forgotten that they are children of our Mother Earth and that their true health and happiness are inextricably dependent on a life lived in harmony with the created powers of nature and the laws of the Great Almighty Creative Spirit that acts through her. The public health institutions of mainstream medicine are not very aware that this represents a basic prerequisite for the restoration of physical and spiritual health in everyone. 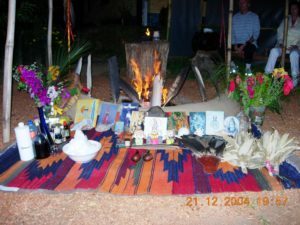 To begin with, the shamanic medicine approach to healing and teaching is a system of knowledge and practices based on altering the consciousness and perception of the therapist, and in some cases, of the patient too. In anthropological literature, this modification of consciousness and perception is technically referred to as the Shamanic Ecstasy of Consciousness. Come With an Open Heart! For participants who haven’t been initiated into the shamanic ecstasy of consciousness, these experiences are still strange and mysterious. Expert leadership is required for them to receive their healing benefits. Those who would like to discover the mystical phenomena of shamanic healing need to be willing, from the very begin- ning, to let go off attitudes of intellectual and scientific arrogance and to see themselves with open hearts as students who are learning in an entirely new way in order to access the life secrets that shamanic medicine can reveal. A flight to the healing within! It should be noted that the complete shamanic cure of Endogenous Depression, Schizophrenia, Multiple Sclerosis and other Degenerative illnesses – considered incurable by mainstream Western medicine – requires an absolute minimum of three weeks. The healing of Drug Addiction (and not only the transitory detoxification) requires a special program of four to six weeks. Day 1 Arrival in Ecuador We will pick you up at Quito Airport and go together to your lodging facilities. Now we have a good opportunity to perceive consciously the vibrations of the surrounding nature. In the afternoon, we meet to share a brief introduction to the principles of action of shamanic medicine and of the sacred power plants of the American tradition. We prepare for our first ceremony with a breakfast of herb tea and unsweetened fruit (B/S) juices. At the right time, we gather at the site for the ceremony. There, the nature and structure of the ceremony will be explained. Any other concerns will be answered. Day 10+11 Rest and hikes. (Fast) /S We will use these last two days again for rest, meditation and energetic integration of the experiences of our retreat. (Fast) Our penultimate ceremony is a shamanic power walk. Since we are now familiarized enough with the lessons and the psychosomatic experiences of the teacher plants, we can venture out into a daytime ceremony in the forest. The shamans of all cultures know, perceive and use the visible and invisible, cosmic, supracosmic, and earthly entities, the nature spirits (gods, demigods from various religious traditions, sun, thunder, fire and other elemental spirits, rainbow, mountains, springs, lakes, sea, trees, plants, animals, crystals and stones) for the healing of men. They look for power places where sources of energy are available for the purification, strengthening and healing of human beings. When we take this walk in the Andes Mountains in a state of shamanic ecstasy of consciousness, the healing energies of nature will lift us to a purified and strengthened vitality. We will experience psychically and physically how negative energies are removed and left behind and how purity, strength, clarity and vitality replace them. What to bring: Short-sleeved and long-sleeved shirts, pants and shorts, a warm jacket for the nights during ceremonies, comfortable hiking-shoes, sandals, swimsuit, hat or cap, plastic raincoat, umbrella, sunglasses, flashlight, insect repellent, sunscreen, binoculars, camera with flash, MP3 or tape recorder, daypack. Cancellations: If the cancellation is made at least 30 days before the start of the program, we will refund all payments. With any inquiries you might have about our retreats using the form below. Dr. Hampejs is an M.D. in general medicine with specialization in neurology and psychiatry. 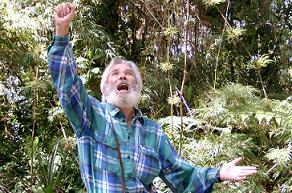 As an officially recognized shaman, he has dedicated himself for the past 25 years to the investigation, practice and teaching of North and South American shamanism.